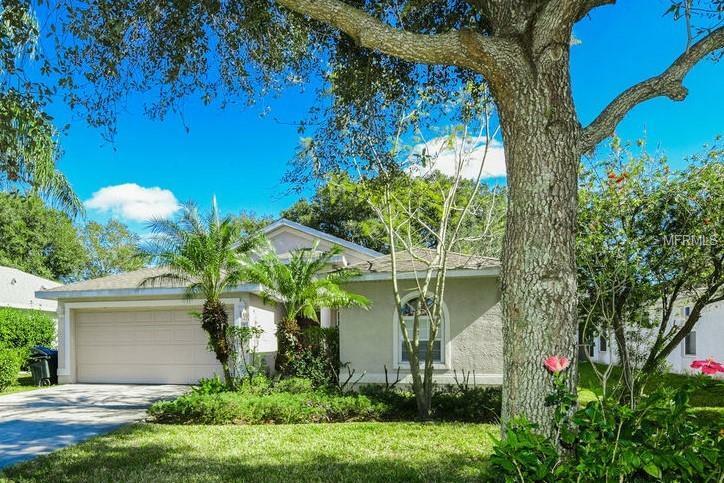 Come see this fantastic move-in ready 3BR/2BA home in the sought after community of Waterford, with its own community pool, beautiful lake setting and low HOA fees. This neighborhood is quiet & tucked away, yet convenient to I75, 275, schools, outlet mall & a brand new Publix shopping center going in around the corner. This home is situated on a large picturesque homesite with mature landscaping, plenty of space for a swimming pool, fire pit and more. It's also one of the lots in the community that can be fenced-in for pets or privacy. Once inside you will find that the home lives large with an open great room concept and popular split plan design. Great for entertaining or a quiet night in...whatever your choice this home has it all with a bright and open living space, foyer, high ceilings, separate formal dining and breakfast nook, tile throughout main living areas, real wood flooring in all bedrooms, plantation shutters, good sized bathrooms with linen closets, separate utility room, large master bedroom with walk-in closet and modern paint colors. The kitchen boasts espresso wood cabinets, newer appliances (2014), pantry and large kitchen island with pendant lights above. Bonus, the HVAC and water heater were both new in 2017 and the exterior was just freshly power washed. Please call for a private viewing. This home has been well cared for and is ready and waiting for its new owners. Additional Lease Restrictions New Management Company Argus Property Management. Call Loryn For Further info. Pet Restrictions See Hoa Rules.